In both 1967 and 1973 wars, Israeli visual-range Mirage III fighters – a 1950s technology – achieved 20:1 or better exchange ratios against Arab MiG-21s, primarly due to better pilots but also small size and good agility – which made it preferred platform for Israeli pilots. Similarly, in the 1971 Indo-Pakistani war, Pakistani visual-range-only F-86s achieved better than 6:1 exhchange ratio against Indian supersonic MiG-21s, Su-7s and Hawker Hunters, in good part due to its small visual signature and good cockpit visibility. Only Indian fighter that managed to match the F-86 was also subsonic Folland Gnat, which had advantage of being the smallest fighter in the war. In earlier 1965 war, Gnat also had advantage over F-86: even Pakistani sources credit it with 3 F-86 kills for 2 losses to the F-86, while Indian sources credit it with 7 F-86 kills. WVR combat is far from being “Vietnam era relic”: in September 2001, 2 IDF/AF F-15s engaged 2 Syrian MiG-29s in a turning dogfight. 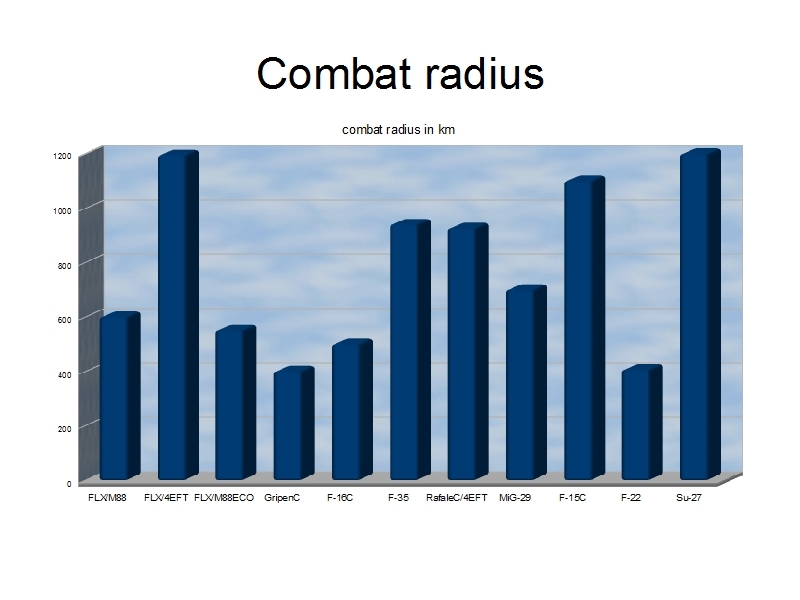 This again shows that BVR combat is still not dominant form of air-to-air combat: fighter aircraft designed around radar-based BVR combat are necessarily more expensive and complex than dogfighters, yet so far an effective BVR engagement has required both incompetent enemy and numerical superiority. Outlasting the enemy will be achieved in three ways: having a high fuel fraction, having a low drag during turning engagements by achieving equal or superior turn rate at lower angle of attack when compared to the opponent and having a powerful engine. Wing loading (or more precisely lift-to-weight ratio) has impact on drag, since aircraft with higher LWR does not need as high angle of attack for same turn rate; additions which improve lift, such as LERX and close-coupled canards are also useful in this regard. Close-coupled canards also reduce drag as smaller control surface deflections are required for same response by the aircraft when compared to identical configuration but without close-coupled canards. 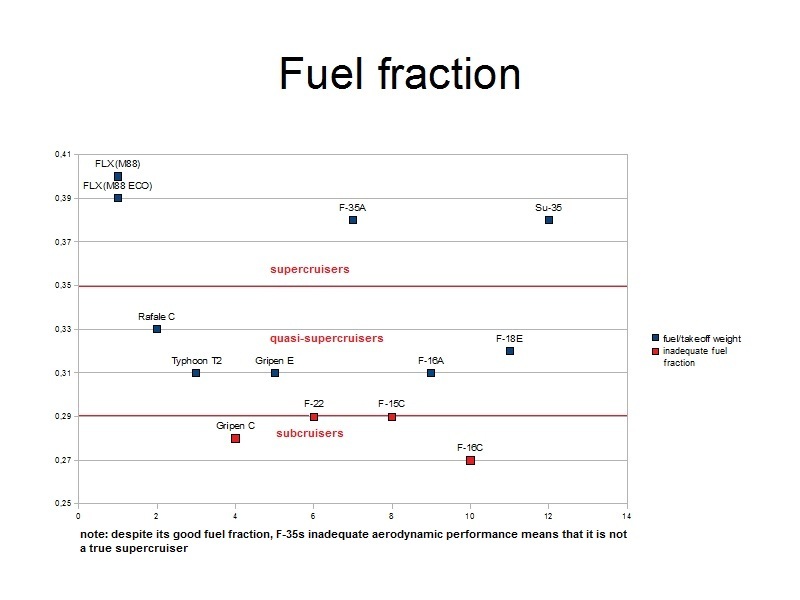 Lower drag will allow fighter to throttle back and keep outmaneuvering opponent while spending less fuel, thus increasing persistence even more than fuel fraction suggests, whereas higher fuel fraction allows fighter to outlast the opponent even if other characteristics (TWR and drag) are similar. “Go-home” range and loiter time of fighter are also highly sensitive to fuel fraction. While having a powerful engine might seem contradictory when it comes to reducing fuel expenditure, it is not so: afterburner uses fuel at rate several times higher than dry thrust, for maybe 50% increase in thrust. 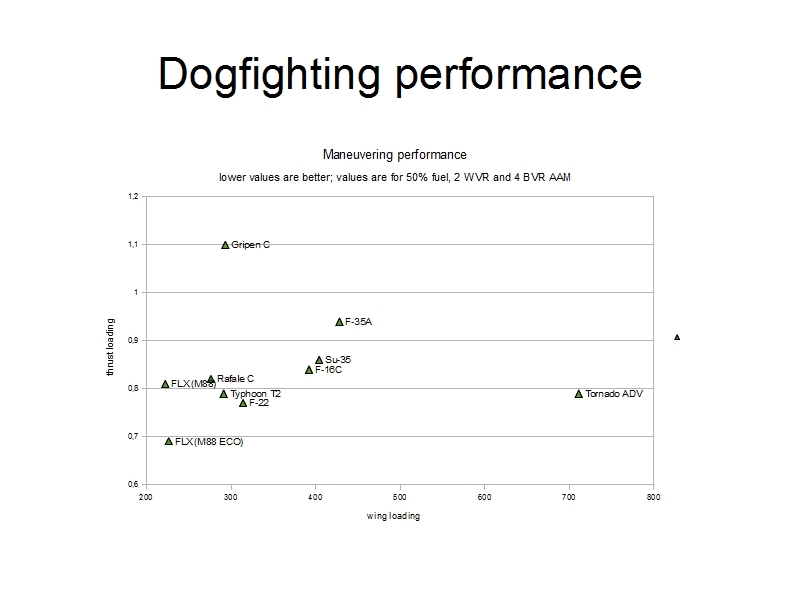 Thus fighter which can stay in dry power for duration of dogfight will usually outlast the opponent even if opponent has higher fuel fraction. Engine will be M88 or M88 ECO. Both offer reduced IR signature, but M88 ECO has higher fuel consumption and thus reduces range at expense of better kinematic performance. 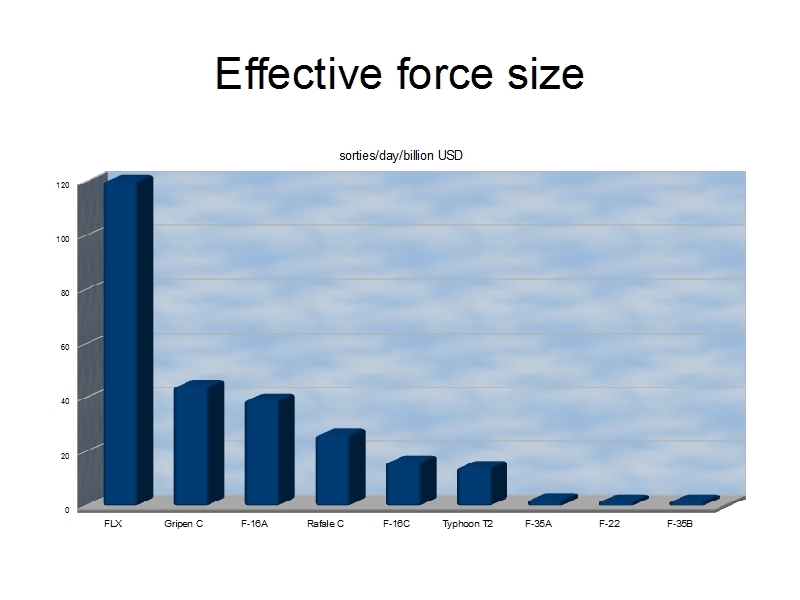 It might be possible to increase range by not using full military power in level flight, however. While cost per kg is significantly lower for aluminum aircraft, there does not appear to be any advantage in total cost for aluminum aircraft; as such, composite-based aircraft is superior choice due to higher performance in all areas. Also, FLX is most likely to cost around 25 million USD; Gripen A costs 30 million USD at 6.600 kg, giving 4.500 USD per kg. Allowing for increase to 6.000 USD per kg for FLX (halfway between Gripen A and Rafale Cs cost per kg), it will cost no more than 26 million USD; low-end cost of 4.000 USD per kg would give total cost of 17 million USD. High end estimate of 8.000 USD per kg – similar to far more complex F-16 C and Rafale C – would give 34 million USD. If this last value is taken, result is 29 aircraft and 87 sorties per 1 billion procurement USD; 17 million USD would give 58 aircraft and 174 sorties per 1 billion procurement USD. 10% increase in wing area causes 1% increase in structural weight. Northrop F-5A was 14,3 meters long and weighted 3.667 kg. It had two engines that weighted 190 kg each, two guns that weighted 80,9 kg each and no radar, giving weight without that equipment as 3.125 kg. Increase in wing area from 15,8 to 28 m2 would thus increase weight to 3.366 kg. With 1 M-88-2 (897 kg), 1 BK-27 (100 kg), and 4 IRSTs (~50 kg for primary IRST, ~10 kg each for 3 missile warners = 80 kg), empty weight would be 4.443 kg. This however assumes that same materials are used; usage of composites would lead to major weight reduction, so 4.200 kg empty weight (7% reduction in airframe weight and 6% reduction in empty weight) is not unrealistic. There is also a possibility for FLX to be navalized; this will likely increase empty weight to 4.800 kg for version with M88-ECO, and increase unit flyaway cost to 29.000.000 USD. FLX uses FOD (foreign object damage) doors to prevent damage to the engine during rough strip operations. FOD doors form part of the air duct roof; when they are lowered, air gets into air duct through intake on duct’s roof. As doors raise, they open up main air intakes, and close off roof ones. Aerodynamically, FLX is most similar to the Saab Gripen and Dassault Rafale. Close-coupled canards and LERX, when coupled with low wing loading, adequate thrust-to-weight ratio and small size will allow FLX to outmaneuver any fighter aircraft in the world. These features will also allow it to take off from and land on very short runways or stretches of road, giving it good survivability in a war; when coupled with low maintenance and fuel requirements, these features will give it excellent survivability and presence on the battlefield. Instead on vulnerable open bases, it will be able to use hidden road bases and road tunnels. It does have a shortcoming in that its wing span is somewhat greater than Gripen’s. Its fuel fraction will also allow it to cruise for longer time in supersonic regime than possible for most other fighters, and to outlast its opponents in dogfight. Roll rate will be better than Gripen’s 250 degrees per second, possibly around 270-300 degrees per second, owing to wing angle. Second advantage is a situational awareness better than that of any other fighter in the world; only Rafale would come close to it once equipped with additional DDMs to cover area directly below the fighter. In fact, Rafale and FLX would be only fighters in the world with complete 360*360 degree coverage with IR sensors, though FLX would have an advantage in that its own visual and IR signature would be smaller than Rafale’s – or vast majority of other fighter aircraft, possible exceptions being F-5 and Gripen. If gun bursts are assumed to last one second, FLX can fire 8 bursts, compared to 2 for F-35A, 3 for F-35B, F-35C, Rafale, 4 for F-16A, F-16C, F-22, Gripen, 5 for Typhoon. Standard missile loadout is 2 WVR and 4 BVR missiles for FLX, Gripen and F-16C, 4 BVR missiles for F-35, 2 WVR and 6 BVR missiles for F-22 and Typhoon, 6 BVR missiles for Rafale, 2 WVR missiles for F-16A. This translates into total number of 3,02 kills for FLX, 1,82 for Gripen C, 1,5 for F-16A, 1,38 for Rafale, 1,82 for F-16C, 2,12 for Typhoon, 0,92 for F-35A, 1,22 for F-35 B and C, and 1,98 for F-22. For 1 billion USD, one can get 40 FLX flying 120 sorties per day, 22 Gripen C flying 44 sorties per day, 33 F-16A flying 39 sorties per day, 13 Rafale C flying 26 sorties per day, 14 F-16C flying 16 sorties per day, 7 Typhoon T2 flying 14 sorties per day, 5 F-35A flying 2 sorties per day, 4 F-35C flying 2 sorties per day, 3 F-35B flying 1,5 sorties per day or 3 F-22 flying 1,5 sorties per day. 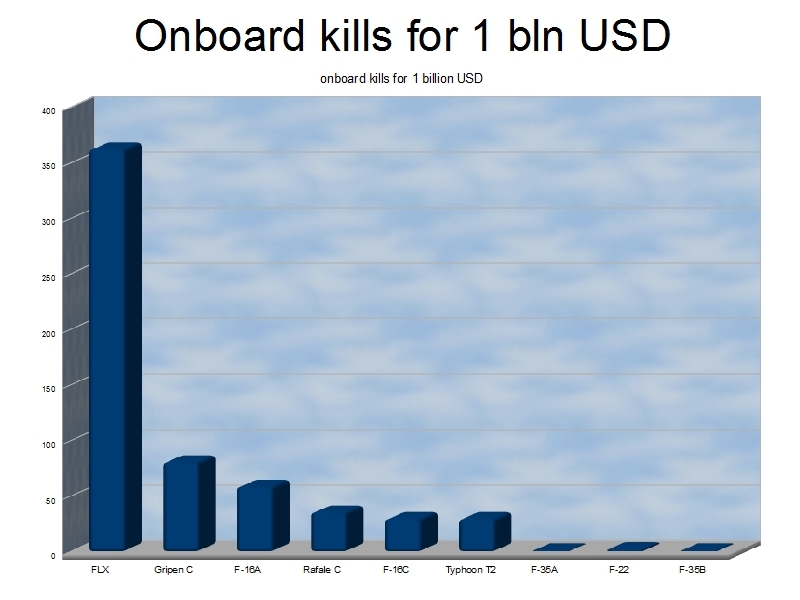 This translates into 362 onboard kills by FLX, 80 by Gripen C, 58 by F-16A, 35 by Rafale C, 29 by F-16C, 29 by Typhoon, 1 by F-35A, 2 by F-35C, 1 by F-35B, and 2 by F-22. As far as older fighters go, FLX would have cost 10 million USD in 1979, providing 300 sorties per day per billion USD; this compares to 2.000 for the F-86, 1.000 for the F-5A, 400-500 for the F-104A and F-5E, 100 for the F-4, 90 for the F-16, 35 for the F-18, 25 for the F-14, 4 for the F-22 and the F-35A. Using low-end estimate of 17 million USD – 7 million in 1979 – would put it at 426 sorties per day; high-end estimate would place it at 213 sorties per day. Whereas FLX will have supercruise radius of 400 km with 14 minutes of loiter time, F-22s range at Mach 1,5 and 45.000 feet is 813 km, with total flight time of 23,4 minutes; with 14 minutes loiter time, F-22s supercruise radius is 164 km (F-22s fuel consumption at M 1,5 is 25 lbs of fuel per nm). 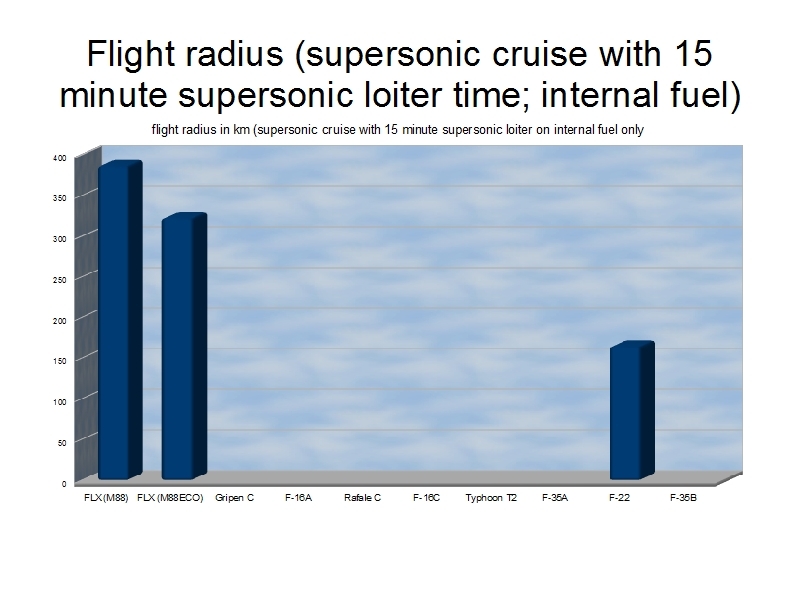 F-16C has radius of 370 km with 10 minutes loiter time, but is incapable of supercruise; this still puts it above heavier (230% of F-16Cs empty weight) F-22 and below lighter (49% of F-16Cs empty weight) FLX. Combat radius on internal fuel is 600 km for FLX, 1.200 km for Su-27, 700 km for MiG-29, 400 km for Gripen C, 500 km for F-16C, 1.060 km for F-18, 1.100 km for F-15C, 406 km for F-22, 940 km for F-35. With 4 external fuel tanks, combat radius is 1.195 km for FLX and 926 km for Rafale C. It should be noted that even 4 external fuel tanks still leave 2 wingtip missile hardpoints free for FLX and 8 hardpoints for Rafale C; 2 tanks would leave 4 missile hardpoints for FLX and 10 for Rafale C. This does not acount for the fact that one can buy 3 FLX and operate 4 FLX for price of one Rafale. It also clearly shows that large fighters are not a necessity even for larger countries, as FLX has 50% larger combat radius than the F-22 despite weighting 21% as much and carrying 34% as much fuel. While most larger fighters do have advantage in range, FLX still has range similar to Russian MiG-29, and better than that of any other fighter weighting less than twice as much as the FLX, as well as that of the F-22. As FLXs small size and low weight (less than that of F-86 or F-5) result in low cost, high level of stealth, good dogfighting ability (especially when coupled with low wing loading and high thrust-to-weight ratio) and easy road basing, it is ideal for smaller countries, but also for large countries that already have heavy long-range fighters (such as Su-27 or its variants) for patrols over large swathes of rarely inhabited areas (Siberia or northern Canada) and require a fighter to ensure that their heavy fighters are not hopelessly outmatched by enemy assault when defending critical areas. It is also interesting to compare it to several proposed light fighters. First one is Pierre Sprey’s air superiority fighter (America’s Defense Meltdown, pg 161). 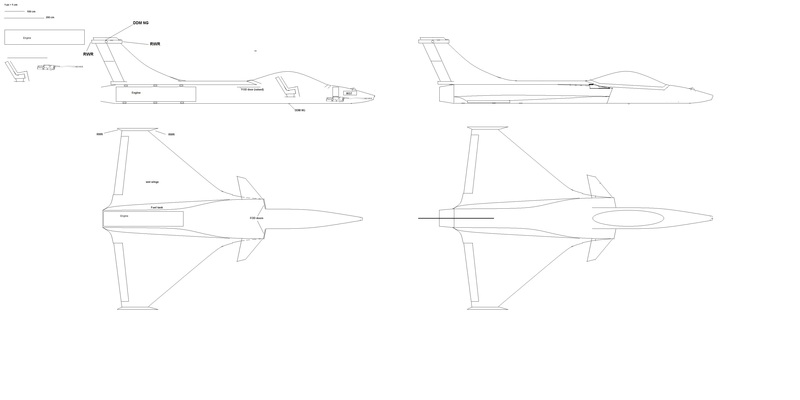 Sprey’s fighter has a unit flyaway cost of below 40 million USD, gross weight of 8.400 kg and 14.700 kgf of thrust. FLX has unit flyaway cost of below 30 million USD, empty weight of 4.200 kg, gross weight of 7.200 kg and up to 9.200 kgf of thrust. Thus FLX is lighter and cheaper, but has lower TWR (1,28 vs 1,75 for Sprey’s fighter). Using EJ-230 instead of M-88 variant would increase gross weight to 7.300 kg, thrust to 12.250 kgf and thrust-to-weight ratio to 1,68. HAL Tejas is projected to cost 34 million USD in FY 2013 USD, empty weight of 6.500 kg, 2.458 kg of fuel 8.600 kgf of thrust, giving it a comparably low fuel fraction and thrust-to-weight ratio when compared to the FLX (fuel fraction 0,27, TWR 0,96 with 100% fuel but no weapons; compare to FLXs 0,4 f.f. and 1,1 TWR in the same configuration). Combat radius for Tejas is 300 km, 1/2 of FLXs. While it does have lower wing loading, it also has lower positive g limit (+8 operational) and inferior aerodynamics. Thanks to its reliance on proven approach of surprising the enemy and avoiding surprise through usage of passive sensors and low visibility to the same, FLX will invalidate radar stealth at very low cost. Even in one-on-one combat it will be far superior to any existing or planned fighter; it will also offer superior force size and reliability for cost, allowing for realistic training – and as shown before, pilot is far more important than the aircraft. High supercruise speed and high level of actual stealth will allow it to achieve surprise against almost all fighters in the world except Rafale and possibly F-35 (if all its systems work as advertised, which is still far from certain), and to achieve first detection against both Rafale and F-35. At the same time, excellent coverage with passive sensors will make FLX itself almost completely safe against being surprised. If fighter like this is ever put into service, it will render all other fighters in service obsolete through combination of low cost, easy maintenance and unparalleled combat performance. Only shortcoming when compared to heavy fighters such as Russian Su-27 is its relatively short range on internal fuel; this can be mitigated through usage of external fuel tanks and tanker refuelling. This entry was posted on October 26, 2013 at 5:55 am	and is filed under proposals. Tagged: 21st century fighter aircraft, air superiority aircraft, air superiority fighter, proposal. You can follow any responses to this entry through the RSS 2.0 feed. You can leave a response, or trackback from your own site.